7,500 Scientologists and guests of the International Association of Scientologists from some 65 nations turned up to embark on a weekend of exhilarating events celebrating a year that marks the 33rd anniversary of the International Association of Scientologists. The assemblage of Scientologists from 65 nations gathered on Friday evening, October 6th, for a celebration that acknowledged 12 months of humanitarian help in the name of the International Association of Scientologists. 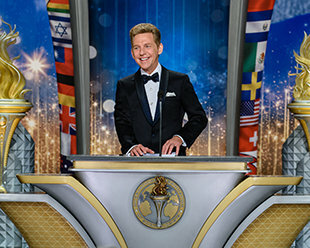 Mr. David Miscavige, the ecclesiastical leader of the Scientology religion and Chairman of the Board Religious Technology Center, welcomed the international audience for the first of three nights in a weekend of festivities. The past year has seen a worldwide humanitarian whirlwind of unadulterated help in the name of IAS-sponsored initiatives from—battling drug abuse and human rights violations, including the field of mental health, as well as instilling morality and bringing aid in times of disaster, both acute and everyday. SAFEGUARDING VICTIMS IN GERMANY The Citizens Commission on Human Rights (CCHR) Germany exposed psychiatric malfeasance among commercial airline pilots and paved the way for a law setting zero tolerance for pilots’ use of psychoactive drugs. DEFENDING THE FAMILY UNIT In Tel Aviv, CCHR exposed systemic psychiatric abuse and child drugging and secured unprecedented due process for parents whose children were unjustly removed from their custody. TAKING A STAND FOR THE LIBERTY OF PATIENTS In India, an outdated Mental Health Act from 1987 was doing little to protect the welfare of citizens, until CCHR India inspired a rewriting of the nation’s mental health law to permanently protect patients’ rights. INSTILLING NEW VALUES IN THE PHILIPPINES The Way to Happiness ambassadors entered uncharted territory in the Philippines, sparking widespread adoption to train some 29,000 police officers on the booklet’s universal moral precepts. AN UPLIFTING MESSAGE FROM THE PULPIT In Zambia, a land where survival is a day-to-day endeavor, an Anglican Minister formed 70 Way to Happiness groups to turn a message from the pulpit into a community plan inspiring a tenfold increase in productivity across a region of 50,000 square miles. DRUG EDUCATION FOR THE MASSES AT RIO OLYMPICS 5,000 Drug-Free World volunteers led a campaign that launched at the Brazil Olympics and saw over 2 million Truth About Drugs booklets distributed across São Paulo and Rio de Janeiro. INTERNATIONAL DISASTER RESPONSE In 2017, Scientology Volunteer Ministers saw action across 22 major disaster sites, ultimately helping over 200,000 individuals recover from physical and spiritual trauma. SCIENTOLOGY VOLUNTEER MINISTER IMPACT IN PERU Scientology Volunteer Ministers were among the first responders to Peru’s northern coast, where dozens of mudslides overpowered the region. Altogether, the VMs delivered succor to more than 75,000 residents. PARTNERSHIP IN THE NAME OF PREVENTION Churches of Scientology formed the core of community disaster prevention in each of their zones. Volunteer Ministers now partner with over 1,400 agencies and organizations. The stars of the bright and dynamic evening were three Freedom Medal Winners, who each epitomize relentless progress toward the goals of Scientologists everywhere for a peaceful, productive and crime-free world, where social justice prevails. The celebration spotlighted the spectacular growth of the Scientology religion and its humanitarian initiative made possible by the IAS. In essence, the evening was a testament to the impact one community can have on humanity in just 12 months. Over the course of two and a half hours, Mr. Miscavige, Chairman of the Board Religious Technology Center, unveiled the accelerating pace of the Church’s expansion and its humanitarian mission reflected in the evening’s diverse stories and presentations. Thousands of Scientologists rose to their feet time and again in celebration of the year’s accomplishments in the name of the IAS. “There was just so much to be inspired by and proud of. We are changing the world with our passion and belief and we are doing it in style!” said one Scientologist attending Friday night’s event. Friday night’s celebration transformed Saturday evening as the Grand Marquee hosted the annual IAS Patrons Ball. The spectacular black-tie dinner and entertainment gala is held in recognition of those IAS members supporting the humanitarian work and initiatives feted over the course of the weekend. The accent on the weekend of festivities was the traditional Saint Hill Charity Concert attended by 1,500 local residents. The crowd was entertained by an array of performers that featured Grammy Award-winning jazz legend Stanley Clarke. The evening of music and dance saw five local charities awarded donations to expand their activities serving the local community and all of it in keeping with the tradition started by L. Ron Hubbard during the years he called Saint Hill home. The narrow old carriage roads that twist and turn through the small villages and farms of West Sussex were crowded with cars and buses on a Friday evening in early fall, as thousands of Scientologists, guests and friends poured onto the well-manicured grounds of Saint Hill Manor—the home of Scientology Founder L. Ron Hubbard. Through openings between the dense hedges and trees that line those roads, visitors could see the distant outline of the elegant Saint Hill—alive with light on the rolling horizon—glowing like distant fire in the fading autumn light. Beyond the Manor gates, past the entrances and down the long sweeping drive to the pavilion and the Great Hall, to a stage erected under cover of a massive marquee, members of the International Association of Scientologists from more than 65 nations filled the air with diverse language as they walked into the arena with a purpose—to celebrate their humanity and that of all mankind. The celebration for 2017 marked the 33rd since the IAS was founded at Saint Hill in 1984 to unite, advance, support and protect the world’s youngest and fastest-growing major religion. Members and guests came also to honor those who helped the Church realize a year of hope and achievement on the path toward Scientology’s goals for a better life for all. “Yes, you’ve arrived at this Kingdom of the IAS,” said David Miscavige, the ecclesiastical leader of the Scientology religion. “Where IAS members from all over this Earth, come in and take a seat: From North America, South America, Africa, Asia, Oceania, a hundred cities of Europe and from all over this United Kingdom. So it was, Mr. Miscavige outlined each punctuation point of that presence across two and a half hours of solid-packed energy. In fact, the night not only surveyed the kingdom of humanitarian outreach from the highlands to the lowlands of Earth, but it further focused on expansion of the religion itself in outlands never previously seen. The accelerating pace of the Church’s expansion and of its humanitarian missions is also reflected in the account of stories featuring diverse expressions of social goodwill. Each story unto itself is a chart-topper, but altogether they form a symphony of humanitarian help spanning renowned IAS-sponsored initiatives. All began with telling accounts of mental health abuse and its rapid reform by the Citizens Commission on Human Rights (CCHR). Campaign action further unfolded courtesy of: Drug-Free World and a power movement driving The Truth About Drugs against the tide of abuse; United for Human Rights, keeping alive the flame of the Universal Declaration of Human Rights; The Way to Happiness instilling moral resurgence through its 21 precepts for universal living; and the wave of Volunteer Minister support brought to 21 major disaster sites this year alone, not to mention countless moments of personal strife for individuals across this world. The Way to Happiness ambassadors entering uncharted territory in the Philippines, sparking widespread adoption to train some 29,000 police officers on the booklet’s universal moral precepts. In Zambia, a land where survival is a day-to-day endeavor, an Anglican Minister forming 70 Way to Happiness groups, turned a message from the pulpit into a tenfold increase in productivity across a region of 50,000 square miles. United for Human Rights enlightening and empowering over 19,000 Pakistani students and subsequently drafting and getting passed, the “Punjab Protection of Women Against Violence Act” to guarantee their rights forevermore. 5,000 Drug-Free World volunteers leading a campaign that launched at the Brazil Olympics and saw over 2 million Truth About Drugs booklets distributed across São Paulo and Rio de Janeiro. And the Scientology Volunteer Ministers traversing 200,000 miles to bring life and hope to nearly four million people including those worst hit by an onslaught of natural and man-made disasters. In the UK, Freedom Medal recipient Brian Daniels, stepped out under CCHR’s banner to tackle psychiatric abuses within the country’s mental hospitals, pointing to misconduct by psychiatrists in the field and forcing reforms. He further inspired a run of national exposés on links between mind-altering drugs and an increase in child suicide, leading to unprecedented “black box warnings” on pharmaceutical drugs to permanently protect British youth. Peacemaker and activist for human rights, Minister Tony Muhammad, created a Way to Happiness movement in the inner cities of Los Angeles, the gang capital of the world, with 50 peace rides across 33 notorious neighborhoods resulting in a 40 percent drop in crime. Tony then persisted in bringing together rival gangs to confront the violence between them, winning a ceasefire and peace agreements between bitter gang rivals—the Crips and Bloods. Binod Sharma, a native of Nepal, launched his VM team in response to the 2015 monster earthquake to bring succor to 15,000 residents in the first five days of response. Binod then led his teams across 101 otherwise forgotten villages and districts hit by disaster, ultimately bringing help to 4 million Nepalese. In the aftermath, and to bring permanent help, he further established a Volunteer Minister headquarters and 169 groups across his nation. Friday night’s celebration was expanded Saturday evening as the grand marquee transformed into the annual IAS Patrons Ball. The spectacular black-tie dinner and entertainment gala is held in recognition of those IAS members supporting the humanitarian work and initiatives feted over the course of the weekend. The accent on the weekend of festivities was the traditional Saint Hill Charity Concert attended by 1,500 local residents. The evening of music and dance saw five local charities awarded donations to expand their activities serving the local community and all of it in keeping with the tradition started by L. Ron Hubbard during the years he called Saint Hill home.